While the Trump Administration is taking a number of steps to bolster coal-fired generation and rescind climate regulations, electric utilities should prepare for a very low-carbon future, former Energy Secretary Ernest Moniz told Utility Dive at the National Clean Energy Summit in Las Vegas last week. 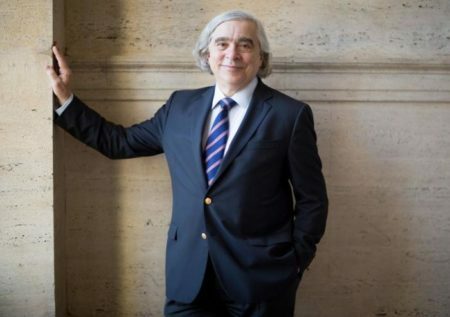 Despite the White House’s withdrawal from the Paris climate agreement, “there is no going back on the fight against climate and the innovation prize is enormous,” Moniz said. “We are talking about multi-trillion-dollar markets. The real issue is that the U.S. needs to capture a big part of that market to keep its innovation edge.” Click here to read more. New website: Shared Mobility Principles For Livable Cities. A consortium of transport experts, led by Zipcar cofounder Robin Chase, recently launched Shared Mobility Principles for Livable Cities to help guide urban decision makers and stakeholders toward new mobility options that benefit all. Electric bus startup Proterra is leading a shift away from diesel-powered public transit to help cities save money, improve health and cut greenhouse gas emissions. This entry was posted in Nebraska / Midwest News and tagged community solar, energy storage, global renewable energy development, Nebraskans for Solar, renewable energy news, U.S. renewable energy development on October 20, 2017 by Helen Deffenbacher.